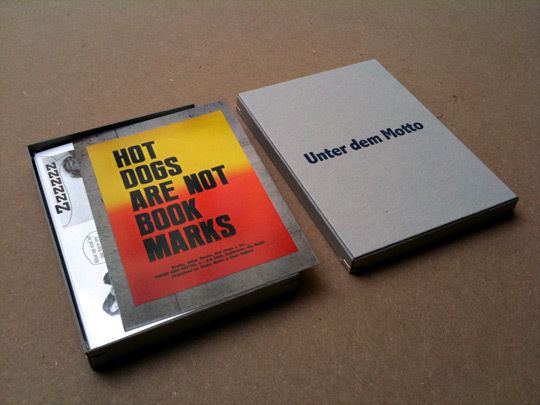 In addition, a selection of titles and publishers operated by Motto will be on display during the fair opening time. In a discussion about graphic design practices with critic Benjamin Thorel we deplored that graphic design sometimes seemed obsessed with frivolous preoccupations of style over content. We joked: “it’s like watching Fassbinder’s Fox and His Friends but just through the sequences happening in the printing/binding factory scenes”. A little later we thought exciting to actually recut the movie and were surprised to see that the story still held. Rainer, what a star. 19 hrs: Opening party @ Miss Read, KW, Institute For Contemporary Art, with Basso and friends. At regular intervals throughout the afternoon on Saturday 4 September, friends and passers-by will read passages from Eva Weinmayr’s play (pause), recently published by Occasional Papers. The collective reading – in the Chino room at Motto, and broadcast live in the courtyard between Motto and Chert – forms part of a series of interventions by Weinmayr around the (temporary?) disappearance of the English art collective Art in Ruins. To date, the series includes the film “I Wonder What the Silence Was About” (concurrently presented at ‘MISSREAD’, KW Institute for Contemporary Art) and the publication Art in Ruins and Unknown Stranger (also published by Occasional Papers). The Civic City Cahiers series intends to provide material for a critical discussion about the role of design for a new social city. It publishes short monographic texts by authors who specialize in urban and design theory and practice. The Design Talk will highlight different approaches to editorial design, featuring a short presentation of mono.kultur’s practice of flexible art direction by inviting different designers to guest-produce individual issues, and introductions to and by previous contributors Mario Lombardo (former art director for Spex, Liebling) and NODE Berlin Oslo (former art directors for 032c, Monopol).